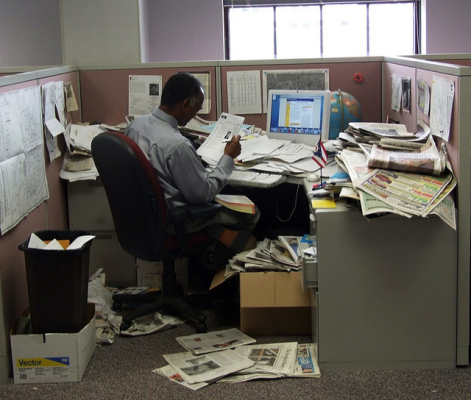 The cleanliness (or lack thereof) of your workspace may directly affect your productivity. People who work in dirty, cluttered offices tend to suffer from lower productivity levels when compared to people who work in clean and tidy offices. It’s just that simple. Unfortunately, though, maintaining a clean office isn’t always an easy task. When you are busy working and trying to meet deadlines, you may not have the time nor energy to clean your office. As a result, your productivity takes a hit. Does this sound like a familiar scenario? If so, we have some tips to help you out! I think we’ve all been guilty of this at some point in time: you bring a snack or lunch to your desk so you can eat while working. In doing so, crumbs and debris will inevitably make their way onto your desk and surrounding computer peripherals. To prevent this from happening to your office, you should refrain from eating all foods at your desk (beverages are OK). If you haven’t done so already, set up a file cabinet in your office. It’s not uncommon for workers to toss documents and mail on their desk, at which point these items begin to accumulate over time. With a file cabinet, you can neatly store and organize all of your documents, keeping them off your desk. And if you think file cabinets are too expensive, think again. You can often find used file cabinets and other office supplies available for pennies on the dollar by searching on Craigslist. When a company upgrades its offices with new equipment, it may sell or even give away its old equipment (file cabinets included) on Craigslist. Why should you include plants in your office? According to a recent study conducted by researchers at four separate Universities, adding plants can increase worker productivity levels by as much as 15%. It’s unknown how exactly plants are able to achieve this, but the general consensus is that they work. No matter how hard you try to prevent it, your office will eventually become dirty and cluttered. This is why it’s a good idea to get into the habit of cleaning it on a regular basis. Perhaps you can make a note on the calendar to clean your office once a week. As long as you clean it regularly, it will promote a positive vibe that allows you to accomplish more work. Do you think working in a clean office can improve productivity levels? Let us know in the comments section below! I think that it depends on the person. I personally need my office space to be clean and have trouble working when it is messy. However, I’ve had coworkers who seem to be able to work well in a messier office. My coworkers think that my cubicle is messy, but I prefer the term “organized chaos.” I have many piles, but I can find anything I need. I don’t think my cubicle affects my productivity at all. Work space cleanliness definitely has an impact on productivity. Those with cleaner offices seem to be more organized and efficient in my opinion. I’m not sure how anyone works in a messy environment. It’s a terrible distraction. I agree with the comment that it depends on the person. While I don’t think anyone can be productive in an extreme environment, such as the one pictured, I’ve worked with plenty of people who manage to be very productive in what I consider to be a “messy” workspace.